State Rep. Livvy Floren proudly represents the 149th District of Greenwich and Stamford. She was re-elected to her 9th term in November 2016, and serves as Ranking Member on the Bonding sub-committee, and as a member of the Finance, Revenue, and Bonding and the Insurance and Real Estate committees. She was also reappointed Assistant Republican Leader by House Republican Leader Themis Klarides. State Representative Livvy R. Floren’s leadership skills and her ability to work with legislators on both sides of the aisle have made her an especially effective voice in Hartford for her Greenwich and Stamford constituents. Under an act originally proposed by Representative Floren during the 2004 legislative session, water companies are encouraged to sell land adjacent to their reservoirs to buyers who will preserve the properties for passive recreation and open space rather than developing them for commercial or residential uses (Public Act 04-200). Representative Floren also proposed a measure (which was included in House Bill 5801) under which no reservoir can be abandoned unless the Commissioner of Public Health determines it will not be necessary to meet the future water supply needs of the state. During her 2001-2002 term, legislation initiated by Representative Floren to preserve as open space a 14.6-acre parcel of state land in north Stamford became a reality with the enactment of the 2002 conveyance act (Special Act 02-9), which she cosponsored. The act transferred the property from the state to the City of Stamford, which is preserving it as open space. The parcel is about two-tenths of a mile from the Mianus River, close to the Mianus River Greenway, and will be a natural addition to it. Funding in the amount of $3,000,000 to purchase 10 buses to provide service for Fairfield County commuters. The buses will make public transportation between towns like Greenwich, Stamford and New Canaan more convenient, efficient and attractive. A $175,000 grant for The Bruce Museum to fund an architectural study to determine the museum’s long-term needs. The museum has grown rapidly over the past few years and its galleries and classrooms are often overcrowded and its collections and exhibition areas have been stretched to capacity. A $300,000 grant to help pay for construction of the Early Head Start First Steps Infant and Toddler Care Center at Armstrong Court in Greenwich. Grants totaling $4,229,919 and $142,981 to pay for Phase II of the revitalization of the Southfield Village housing complex in Stamford. $500,000 to help fund an ambitious renovation and improvement project at the Western Greenwich Civic Center. $500,000 for the renovation of the Greenwich Boys and Girls Club. $67,500 for various improvements and upgrades at the J. M. Wright Vocational Technical School in Stamford. $245,000 for emergency service communications upgrade for the Greenwich Police Department. Rep. Floren also secured a Small Town Economic Assistance Program (STEAP) grant of $50,000 for renovation and updating of the Greenwich Health Department laboratory, and 2 STEAP grants totaling $450,000 for installation of dry hydrants for the Greenwich Fire Department. She also helped coordinate the $500,000 STEAP grant for the renovation of The Nathaniel Witherell skilled nursing facility. In addition, Representative Floren cosponsored a law (Public Act 02-95) that established one-year moratoriums on final approval by state agencies of proposals to build overhead electricity transmission lines from Bethel to Norwalk and energy and telecommunications lines under the Long Island Sound seabed between Connecticut and Long Island. Representative Floren also was an original sponsor of a law that prohibits the application of pesticides on the grounds of public and private schools, and child day care centers, except to eliminate an immediate threat to human health. She cosponsored an act that requires insurers to offer both mammography and magnetic resonance imaging as options for breast cancer screening for women with family histories of breast cancer. To help preserve undeveloped acreage in Connecticut, Representative Floren cosponsored an act that prohibits anyone from encroaching on open space land owned by the state or a nonprofit land conservation organization without permission or legal authorization. Municipalities are allowed to freeze property taxes for certain elderly persons under an act Representative Floren cosponsored. To be eligible for the benefit, homeowners or their spouses must be age 70 or older, have lived in the state for at least one year, and meet the same income limits that apply to the existing state-reimbursed “circuit breaker” program. Representative Floren serves with a variety of community organizations and has been active in local government and politics for many years. She understands the special needs and challenges facing the 149th District and is committed to dealing with them. Representative Floren is a former member of the Greenwich Board of Estimate and Taxation. She also served two terms as a member of the Greenwich Representative Town Meeting. She is an associate member and former treasurer of the Greenwich Republican Town Committee. 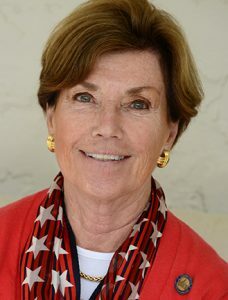 Representative Floren’s civic involvement includes: the Air Conservation Trust Board of Trustees; co-chair of the Boys and Girls State Commission; and advisory board member of Community Centers, Greenwich Community Gardens, the Greenwich Point Conservancy, and the Stamford Watershed Association. In 2015, Rep. Floren was honored with the David N. Theis Outstanding Service to the Community Award for her work on behalf of the people of the 149th district and surrounding communities. A Greenwich resident for 44 years, she has been married to Doug Floren for 49 years. The Florens have four children: Jenny, Melissa, David and Clay, seven grandchildren – Greta, Dean, Bella, Anna, RJ, Lina and Magda.